How to sew a bag on a stool for the kitchen with his hands? Over time, the appearance of the furniture lost: decaying upholstery, paint oblazit and furniture becomes not as attractive as before. However, this is not a reason to get rid of old chairs and stools, because there are many ways to return the dilapidated furniture to life. It is about them and will be discussed in this article. One of the easiest methods of updating the furniture? This tailoring of new covers with their own hands. Such a finish will not only return to the life of the furniture, but also to adapt it to the interior of the room. Stools with updated covers look very stylish and attractive. And in order to create such beauty, it is not necessary to master the skills of professional handy people. independent sewing "Clothes" for seats with backs takes a lot of time and effort, but in the end, you get what so wanted? nice and updated furniture. 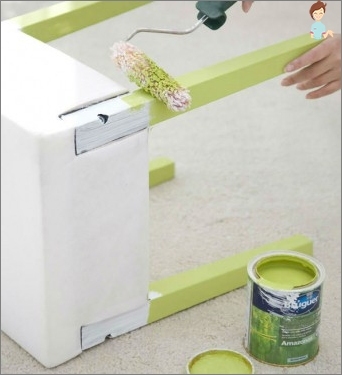 Through this, you will be able to choose the best option for the transformation of the pattern of the stool. To cover it easier to remove, you can put on the back zipper. As you can see, you can make a simple case, even without the pattern. 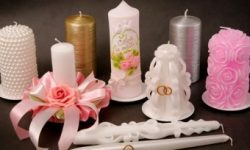 If you want your stool looked particularly, decorate the product satin ribbon or lace. 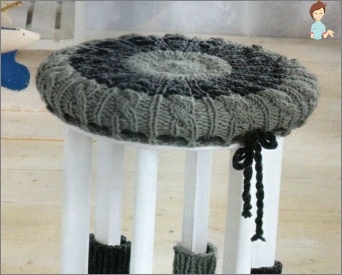 Typically, on such a principle are sewed "Clothes" on kitchen stools, making them more interesting and attractive. 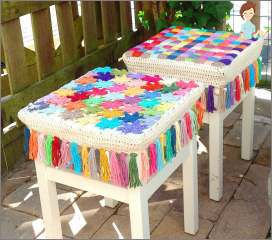 Make a pattern of protective covers on the stool with his hands easy. To do this, you need to take your measurements with the seat and move them to a piece of paper or cardboard. But usually many needlewoman do without them, making the layout immediately on the fabric. 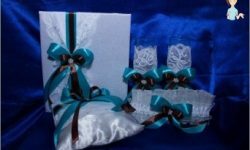 If you are new to this kind of work, it is better to make a pattern, so as not to spoil the material. 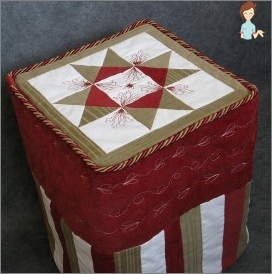 Sew a cover on a square stool with his hands is very simple. This will require quite a bit of fabric, as the product will be made clear by the size of the seat. If a stool without a back, you can easily do without a pattern. To do this, simply flip it and put on the expansion of the fabric. Then simply take your measurements, taking into account allowances. 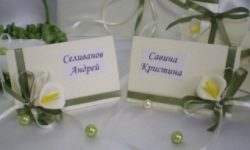 that "Odezhka" tight against the chair, on the edging will need to make a Drawstring, which later pasted gum. 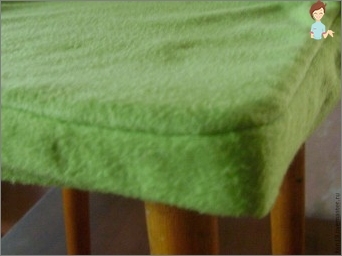 To sew a soft seat, measure the desired length and width of the foam, attach it to the inside of the workpiece and cover with the second piece of fabric on the chair size. Sponge products always attract the surprisedviews of the people, because the technique is so original that once there is a desire to sit on the clad in beautiful furniture covers. The main principle of the art is that the front side of the product is represented by a variety of bulk colorful cushions that immediately catch the eye. Of course, make such beauty is not easy, but be sure that the result will certainly not disappoint. Motives can choose any brand, so there are no restrictions in the colors do not and can not. The main thing that you liked yourself. Patiently and slowly prostrochite entire workpiece with the front side of the cushion pad to sostrochit all to face. "Biscuit" beautiful kitchen stools necessarily create a warm and cozy home atmosphere. 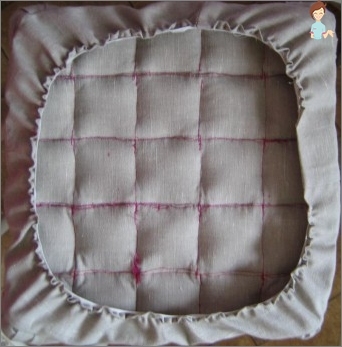 Cover on a round stool sewn with your hands on the same principle as the square. The only difference is in the seat configuration. Optionally, the seat can be filled with the principle that has been described above. sew original "Odezhku" furniture easily, most importantly, do not be afraid to experiment. As practice shows, the best products are obtained only if the person gives free rein to his imagination. If the sewing machine comes to life, try to refresh old furniture in your hands alone. After all, the home-made products fill the house with warmth and comfort.